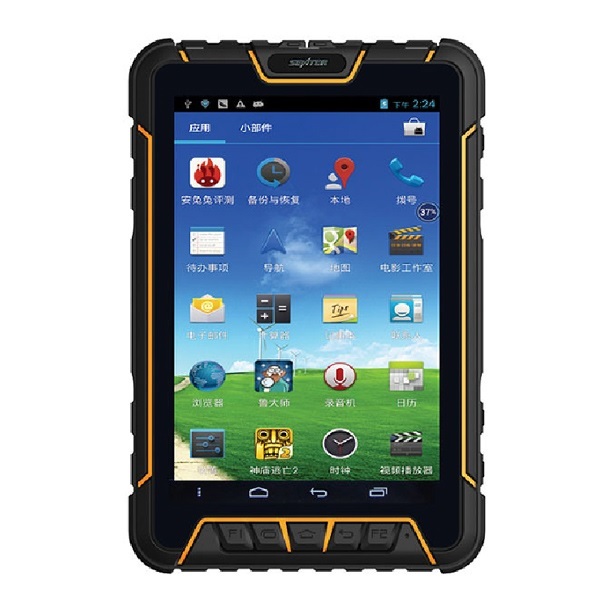 Extremly rugged tablet PC with 7" touch display, Android 4.4 and optional RFID (LF / HF / UHF) for extreme operation (indoor/outdoor). Humidity can’t really bother the AGX TPA-One. It’s a waterproof tablet that can be immersed in water at 1.2 meters depth, even for 40 minutes. This opens numerous possibilities in the maritime world, or in healthcare workplaces where disinfection is needed. The AGX TPA-One is the most rugged tablet on the block. It even lives up to US military standards, being MIL-STD-810G certified. Needless to say that it can resist shocks in an unrivalled manner. It’s the right tool to use in transport, construction, logistics or for military activities. Smart roaming is possible thanks to Dual SIM Quad Band. Voice and data connections run flawlessly at the same time. Data traffic can be managed via mobile networks or WIFI. And thanks to Bluetooth connectivity, extra solutions become reality: LEL meter, helmet communication and more. Bottom line: The AGX TPA-One ensures you’re connected – always and everywhere. The AGX TPA-One tablet runs on Android, the most versatile operating system. This opens up a world of applications: compass, man down, track & trace … Your company will thrive on countless new solutions. Don’t worry about disturbing reflections. Even when the sun shines directly onto the screen, the tablet’s 7” display remains easily readable. The AGX TPA-One tablet is equipped with an 8 Megapixel Camera. Enjoy streaming video applications and photography in High Resolution. The AGX TPA-One fits right into the IT infrastructure of your business. The Remote Device Management Solution (RDMS) enables them to run applications that are specifically tailored to your activities. Either LF, HF or UHF. It does not matter which one is needed the AGX TPA-One masters all of them. No other Tablet PC can show this flexibility. In consequence it leaves no wishes open.